James Wells Champney was born in Boston, MA in 1843. He studied drawing and took classes in anatomy at the Lowell Institute under Oliver Wendall Holmes. He serve in the Union Army during the Civil War along with his cousin and fellow artist, Edwin Graves Champney. Champney was a member of Company G, Forty-Fifth Regiment Massachusetts Volunteer Militia and was stationed at Fort Macon and Fort Spinola (near New Bern). Discharged because of malaria, he returned to civilian life and taught drawing from 1864-1866 at Dr. Dio Lewis's Young Ladies Seminary. Two books of sketches were rendered while Champney was stationed in North Carolina during the Civil War. They depict camp life, rural scenes, ships, artillery and portraits of people, including soldiers and African-Americans he encountered. Some of the places he sketched include scenes from Fort Macon, Fort Spinola, Reidsville, New Bern and Morehead City. James Wells Champney was born in Boston, MA in 1843. He studied drawing and took classes in anatomy at the Lowell Institute under Oliver Wendall Holmes. He apprenticed with a Boston wood-engraver at the age of 16, but left the practice in 1862 to serve in the Union Army during the Civil War along with his cousin and fellow artist, Edwin Graves Champney (33MSS-104, Civil War Sketches). Champney was a member of Company G, Forty-Fifth Regiment Massachusetts Volunteer Militia and was stationed at Fort Macon and Fort Spinola (near New Bern). He remained with the Federal forces that occupied portions of Eastern North Carolina from his arrival in the state in 1862 until his departure in June 1863. Discharged because of malaria, he returned to civilian life and taught drawing from 1864-1866 at Dr. Dio Lewis's Young Ladies Seminary. In 1866, Champney decided to become a professional artist and went to Europe to study. He left for London in October, then ventured to Ecouen, France to study with Edouard Frere. Champney spent the year 1868 in Antwerp studying under Van Lerius. Upon his return to the United States in 1870, he settled in Boston and opened a studio where he continued producing genre paintings. Among Champney's accomplishments were a commission by Scribner's to illustrate "The Great South", a series of articles by Edward King, and several exhibitions, including at the prestigious Paris Salon, the Knoedler's Gallery in 1897, and at the Centennial Exhibition in Philadelphia. Champney died in an elevator mishap while leaving the Camera Club in New York City in 1903. The North Carolina Maritime History Council purchased the sketchbooks in 1994 with contributions from the Kellenberger Foundation of New Bern, the North Carolina Museum of History Associates and Friends of the North Carolina Maritime Museum. 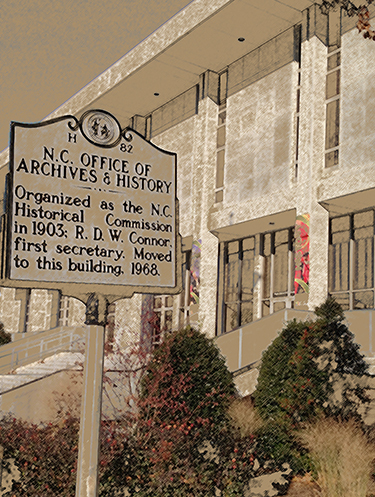 The NC Maritime History Council then donated the books to the History Center in 1995. Two small sketchbooks predominantly pencil sketches on paper; some ink and watercolor renditions. The sketches were rendered while Champney was stationed in North Carolina during the Civil War. They depict camp life, rural scenes, ships, artillery and portraits of people, including soldiers and African Americans he encountered. Some of the places he sketched include scenes from Fort Macon, Fort Spinola, Reidsville, New Bern and Morehead City. The sketches serve as an important visual record of Eastern North Carolina during the Civil War.